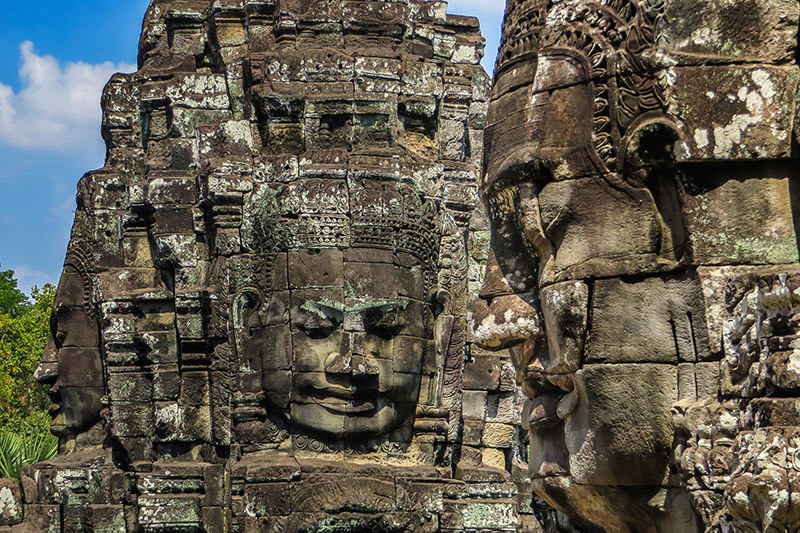 One of the main reasons people visit Cambodia is the huge and impressive Angkor temple complex. We had expected a lot from Angkor but we never would have imagined it would be so big with so many different temples spread around such a large area. 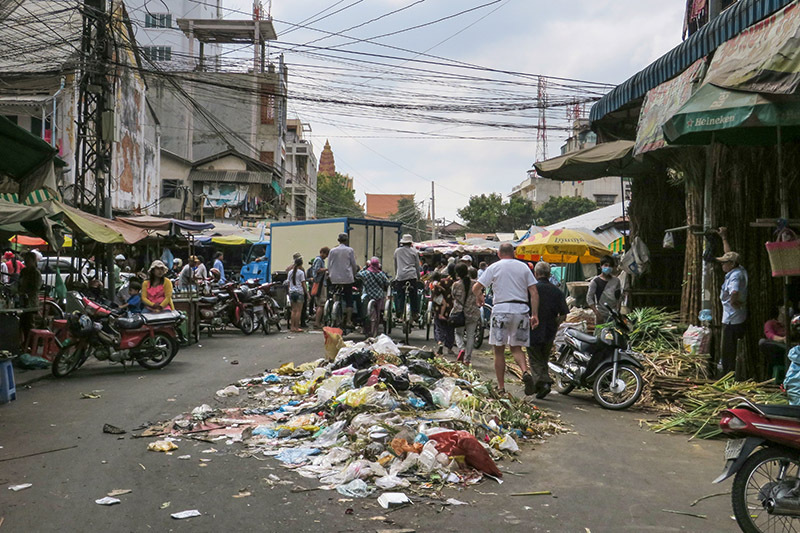 As is the case for most people our Cambodia journey started in the capital Phnom Penh - which is neither a beautiful nor particularly interesting city... not too much to see here. We still had a nice time with a lovely couple we met on the bus. in the streets of Phnom Penh. While we were there the waste collection was on strike. As Phnom Penh was uninspiring we did not stay long and hopped on a bus to our next destination. It was a pleasure driving through the Cambodian countryside - plains with palm trees, elevated houses on sticks, water buffalos, children playing in the school yard with one big tree in the middle. Our advise: in high-season book a room ahead. We bought a three day pass for Angkor which cost 40 US$. Three days gave us enough time to explore the area without hurry. As you are allowed to use the 3 days non-consecutively we explored Angkor for 2 days in a row and then had a rest day before going to Angkor for the third time. The rest day made sure we would not suffer from the well known "temple syndrome" ;-) and that even on the third day we could still appreciate everything we saw and "process" the huge amount of impressions. 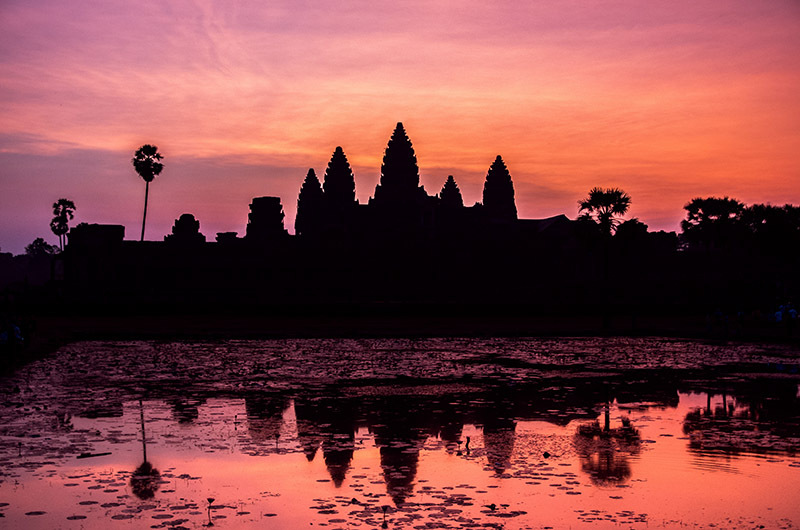 The entire Angkor temple area - which is unbelievably large and covers more than 200 square kilometers - consists of the main and best known temple Angkor Wat and numerous other temples. We ended up liking the Ta Prohm temple the most. As the entire Angkor area was abandoned for hundreds of years nature took over and huge spung trees grew over the temples. At Ta Prohm there are massive trees growing on top of walls with large roots reaching down to earth. The atmosphere was wonderful with a jungle sound of animals chanting that was so cliché you had the feeling somebody was playing back a CD on huge speakers. Every time we went to Angkor we got up super early and made sure to leave Siem Reap no later than 5:45. Like this we had 3 hours of calmness and only few tourists in the morning before the masses start rolling in at around 9AM. This is true except if - like we did on the second day - go to watch the sunrise at Angkor Wat - the masses of people were just incredible. And although we left really early we only got a place in the third row to watch the sunrise. When you go to a very famous tourist attraction you are most likely to have high expectations. This was indeed the case for us when we came to Angkor and luckily we were not disappointed at all. But this was also a result of our way to explore Angkor: be there super early and do the exact opposite as the main tourists group do - for example go around the "big circle" in the opposite direction and be at a major temple (like Bayon or Angkor) exactly at noon when at least some groups disappear for one hour to have lunch. After some wonderful days in Angkor and Siem Reap it was time to move on... So we took a bus from Siem Reap to Kratie which was supposed to need 6 to 8 hours for the 390 km journey. At half way there was a stop where we needed to change busses. As it already took 6 hours to get to this point we were aware we would probably not make it to our destination in regular time ;-) We were supposed to wait for one hour for the next bus. But every hour they came to us and said "well there is a problem with the other bus so you will have to wait for another hour". Turned out "another hour" meant waiting for the next bus for 5.5 hours. But hey - we had wonderful company and those are the stories you will remember even years later. So after 15 hours we arrived in Kratie. Kratie was our last stop in Cambodia. There was nothing special to see which in a way made Kratie special - it was very authentic. 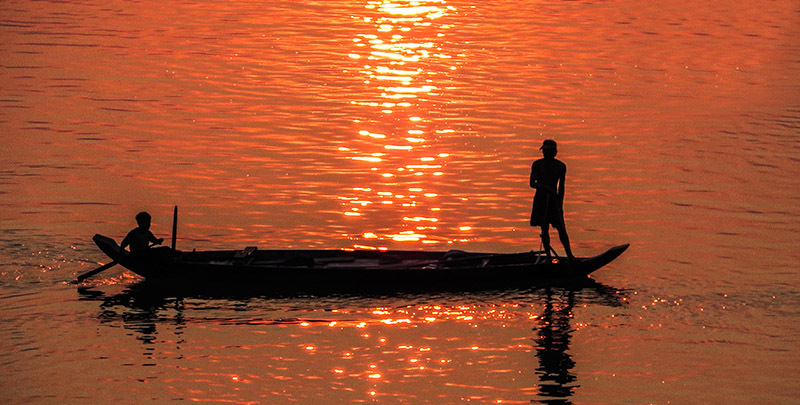 We enjoyed wandering around town and the market, communicated with hand and feet to find an ATM and watched the peaceful sunset at the enormous Mekong river. The next day it was time to say "good bye Cambodia - hello Laos"
"No TukTuk today and tomorrow" was the slogan of a popular T-Shirt in Cambodia - for a good reason... it ended up being rather annoying just how often you get asked if you want a TukTuk. Apparently Asians do not know that if Europeans / tourists want something they just go somewhere and ask for it. it seems to us that for Asians (mainly Chinese, South Koreans and Japanese) it was way more important to pose in front of temples / buildings than to admire the scene and inhale the atmosphere. And they always seem to appear in groups of at least 25 people. "Lady you buy cold drink" was one of the most heard and most annoying sentences while visiting the Angkor area. although Cambodia has its own currency all the tourist prices were in US$. And the ATMs also only gave US$. sadly for the staff at Angkor Wat it was more important to force you to take a specific path through a food stall complex than to protect the site itself / reduce the amount of tourists that climb anywhere and erode the stones. it is estimated that by the time Angkor was at it's climax / zenith (around the 12th century) there were 1 Million people living in the area compared to 50.000 inhabitants in London at the same time.